The Craveros are old family friends and I have known these girls just about since they were born. Claire is in Siguatepeque, “Sigua,” for the summer, doing some health volunteering in my old stomping grounds of the mountains of Honduras. She’s been to a host of other places too, including India. Anne is spending the summer in Sitka, learning to take pictures of whales among other things. Check out their blogs — but I wouldn’t even try to keep up. Anyone for some fair trade organic coffee? The returned Peace Corps volunteer who started the company that now manages my program to help lower infant mortality in La Esperanza, Honduras recently started a coffee company. 100% of the profits will go towards projects that are part of W.A.S.H., including my program. 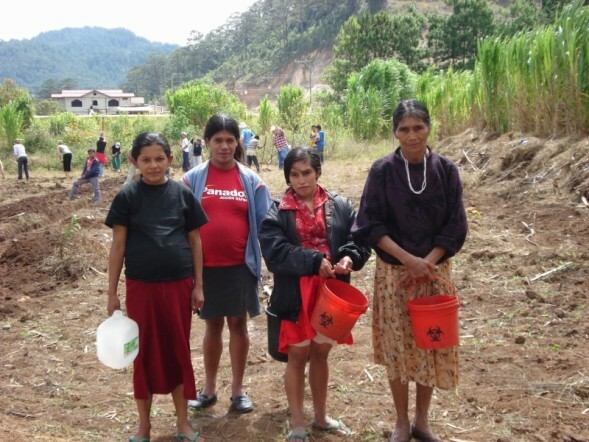 Volunteers in La Esperanza have been working to build a self-sustaining garden for the women staying at the albergue, but they are in need of some additional funding. So if you want some delicious organic coffee and to know that you are supporting both an ethical business model and projects for a non-profit organization, drink up. Order some of the best fair trade organic coffee in the world. As I mentioned in an earlier post, my nutrition education program in Honduras has continued. A wonderful peace corps health volunteer is leading the project and incorporating the help of the new volunteers that arrive with the program I volunteered with. In an effort to make the project more sustainable without indefinite help and donations from foreign countries, the current volunteers are planting a garden to help keep these valuable foods available for the women staying at the albergue. We need some extra donations to help cover the initial input cost of the garden. The volunteers have had to purchase calcium deposits, fertilizer, compost, and small trees. Many of the volunteers from the program I went with have donated their own personal money, but I would love to be able to solicit some more donations for the project. The volunteers are getting the seeds, workers, and few other things for free, but the project could really use another 150 dollars or so to help cover the costs of the trees and plants. Please click on the water and sanitation health website to donate. Specify that your donation is for the infant mortality project in La Esperanza. Check out the pictures to see the progress on the garden so far. My project in Honduras lives on. The nutrition program at the Albergue is now being run by a health Peace Corps volunteer in La Esperanza. And donations can now be accepted through an official non-profit (with a tax ID number and everything). Donations will help to bring education and nutritious foods to women from rural areas waiting to deliver their babies at the hospital. If you or your company are thinking of making holiday or end-of-year donations, please keep this project in mind. If you or your company are looking to make even more substantial donations, please browse through the rest of the Water and Sanitation Health (WASH) web site. They have terrific projects all over the country. And I can tell you honestly from experience that ALL of the donation will be used towards the projects. Not a single employee is paid anything from the donations, because there aren’t any employees, only volunteers. Reverse culture shock is an incredible force. But its real trick is in its sneaky, almost invisible nature. Many people claim that reverse culture shock is stronger than the initial culture shock of going to a foreign country. I don’t really think that’s true. Reverse culture shock is not stronger than the initial culture shock, but because its harder to recognize and understand, it takes longer to overcome. I think that mine is finally beginning to dissipate. Of course you become a bit freaked-out when you watch barefoot children with reddish hair and swollen bellies chase chickens over dirt paths, or listen to a pregnant woman tell you how hungry she is, and realize that these are scenes that will become normal. Your stomach starts to ache after the fifth straight meal (breakfast included) consisting primarily of beans and corn tortillas. You shiver thinking of holding your hand under the shower, knowing that it won’t ever warm up, and psyching yourself into getting into it anyway. But even the cold water isn’t as disorientating as when you turn on your shower the next day and nothing comes out. And then you realize that you don’t miss the water as much as the lights when the power is out for the better part of two days. I spent my first two or three weeks in Honduras in a state of shock, until I found the projects that would define my volunteer experience. It was a state of shock that I and everyone else understood. It’s much more difficult to understand how much you miss all of it once you have returned to the comforts of home. Last week I spoke with one of my best friends who had spent significantly more time than I had living in Central America. We returned to the US around the same time and when she called last week, the first thing she said was, “Do you still feel weird?” It was the first time since I got back that I really felt that it was alright to still be readjusting. When people ask how you are doing you can tell them all about how nice it is to have hot water, power, grocery stores filled with things you cannot even imagine, or that someone can deliver hot pizza to your door, but in truth, few of those things were things that I really missed while I was gone and none of it explains why it feels so weird to be home. It seems like coming home should be easy. That is one of the trickiest things about it. Everyone assumes that coming home will be easy, but in reality it probably rarely is. You never return to a home that is just the way it was before you left, because home changes even when you aren’t around. And its even more difficult to return home when not only it is different than you remember, but everything in your cultural surroundings has changed as well. I miss my community in La Esperanza. I miss my host family, I miss my work, and I really miss speaking Spanish. As hard as it may be to believe, I miss rough beans and dry corn tortillas and sour butter. I miss long afternoons spent eating lunch at the restaurant with a generator when the power was out. And occasionally, albeit rarely, I miss really cold showers. I miss buying oranges from street vendors and I miss so much more. But, at least the shock is wearing off. This is the volunteer’s complete travel guide to Honduras. If you are going to be volunteering in or visiting the country sometime soon, you will want this guide. It contains not only a complete suggested travel itinerary, but also information on what to bring, how to access your money, how to use the buses, and all important toilet-paper tips. I have been asked for travel advice for trips to Italy several times since my return from that country. I am able offer some guidance on the country, but unfortunately I did not carefully record all of the beautiful tricks that I learned while living there. I have already had some soon-to-be volunteers contact me for information on Honduras, and I hope this travel guide will help you on your adventures. 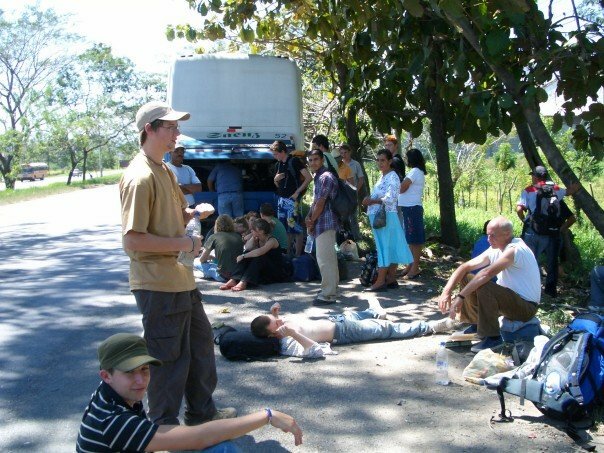 A broke-down bus outside of San Pedro Sula. This may happen to you if you follow this travel guide, though hopefully not. The good news is, though, that if you follow it correctly, you won’t hardly care.